"Me and my sisters love this recipe. It's fun and easy, and kids love it. Roll in sprinkles or any kind of chopped nuts." Place the chocolate chips into a microwave-safe bowl, and microwave on Low until the chips barely melt, about 2 minutes. Stir the melted chips smooth. Place the sprinkles and chopped walnuts into separate shallow bowls. 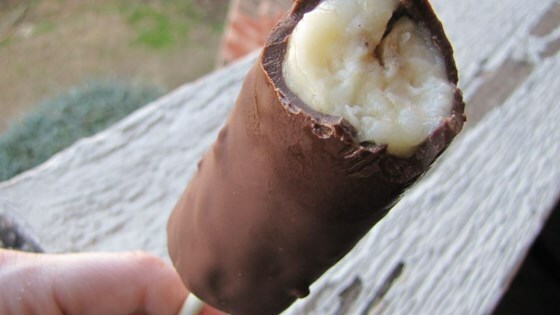 Dip each banana half in melted chocolate, then roll in candy sprinkles and chopped nuts. Place the coated bananas on waxed paper, and freeze until the chocolate hardens, about 5 minutes. The nutrition data for this recipe includes the full amount of the chocolate, nuts, and sprinkles. The actual amount consumed will vary. Loved them. I also froze the bananas first, then put the chocolate on, and then sprinkled them with coconut flakes. Yum! I agree with others it would be better to freeze the banana on the stick first to make it more stable. These are a yummy treat and a great alternative to ice cream.